I am really enjoying the visual documenting of our day-to-day this week. Unfortunately my camera's battery charger has gone missing (hmmm...where did Sam hide it???) so I am reduced to using my iPhone for picture-taking! Not bad, but not the greatest. During this project I am realizing how much time I spend a) cleaning up around the house and b) on the computer...emailing & blogging. And while these are definitely part of our normal day-to-day life, over the next few days I am going to try to curtail these activities a little to free up time to do some more fun things with the boys. 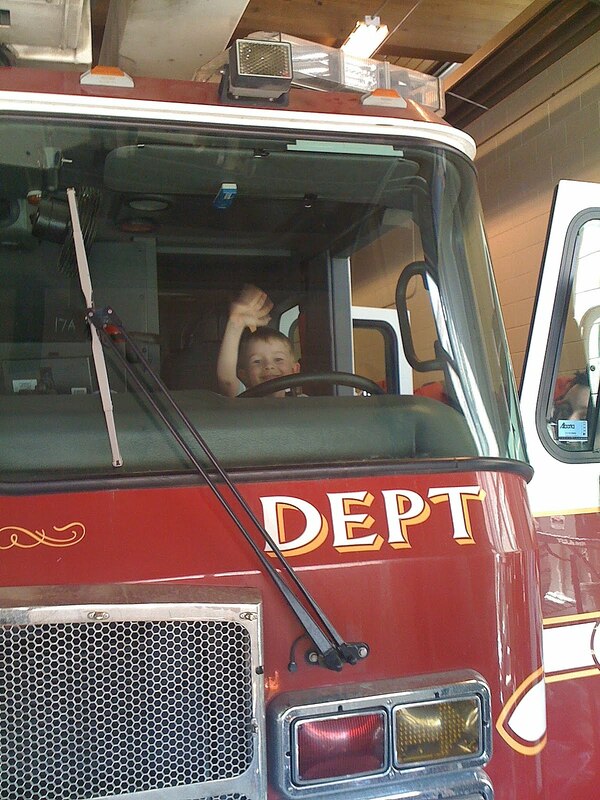 We did have some fun today. I had to pick up a gridwall display unit. 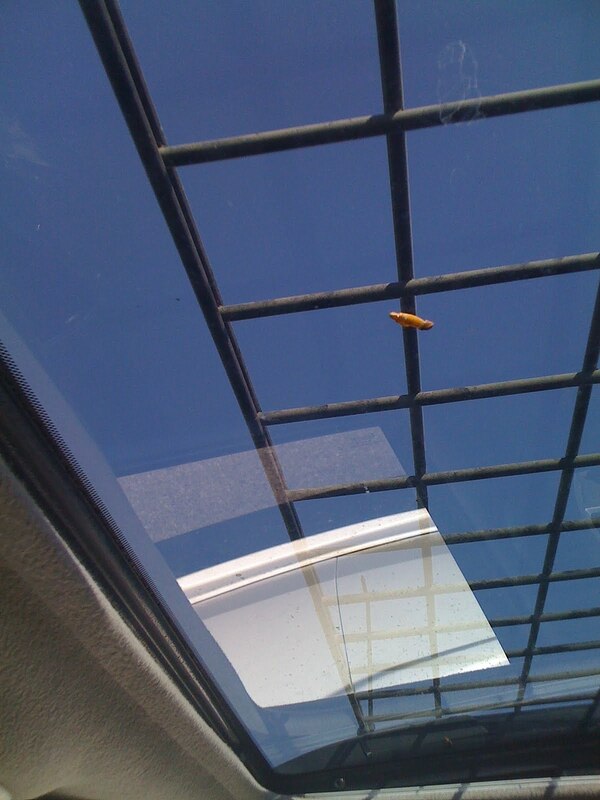 It was too big to fit IN my Jeep so we had to tie it onto the roof. I was so nervous about it flying off I opened the sun roof to keep an eye on it. 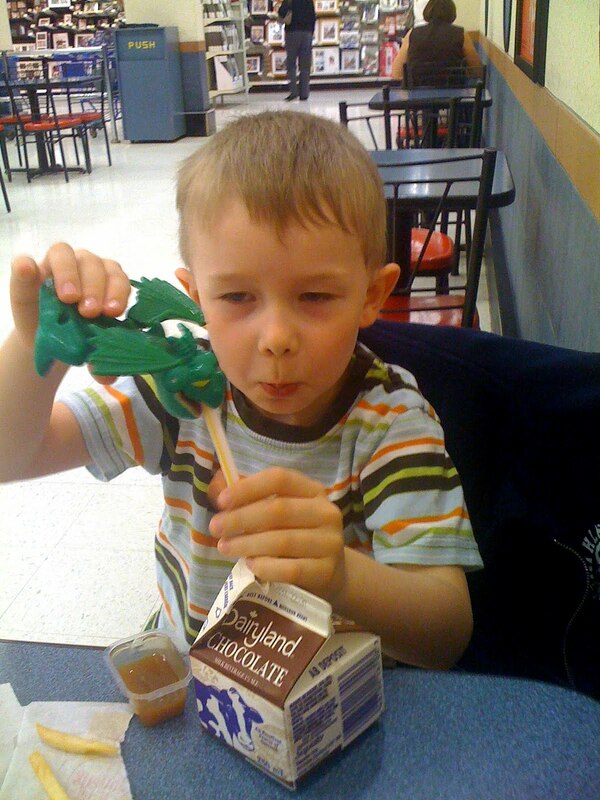 The boys and I had a quick lunch at Rotten Ronnies (McDonalds) where the toy dragon from the Happy Meal drank as much chocolate milk as Grayson did. Then for the fun part...we went to a local firehall for a field trip with Grayson's Pre-K class! 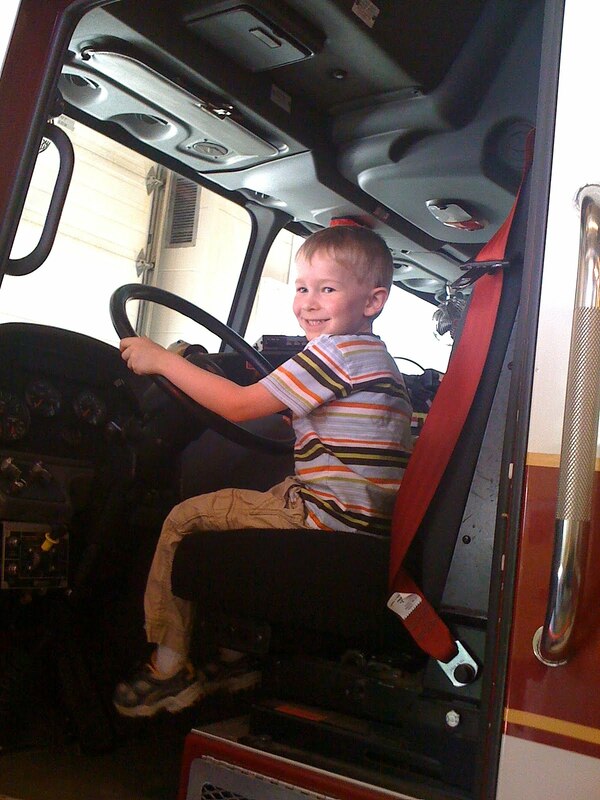 He was beyond excited! 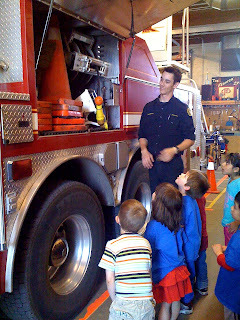 The firemen gave them a tour of the hall, and showed them around the trucks. Grayson loved sitting in the cab of the truck and pretending to drive it. 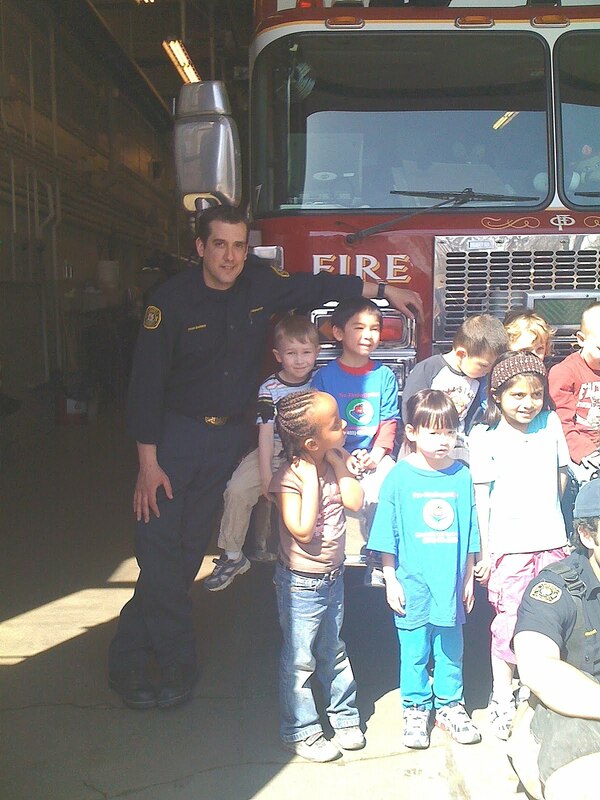 All the kids had a great time and I think it is a welcome change for the firefighters too. It was my bookclub meeting tonight, so I made a quick supper of Sloppy Joes and Veggies and Dip before I left daddy in charge of nighttime routines. I have been part of this bookclub for over 5 years now and we have read some great books as well as some duds. Tonight we were discussing "Shanghai Girls" by Lisa See. Unanimously we loved it - lots of Chinese history without it being pendantic, and enough real life to make you feel close to the characters. Our next book pick is "Nineteen Minutes" by Jodi Picoult. The pics from bookclub didn't turn out (iPhone, bad light, you get the idea) but I thought I would document what's on my nightstand right now. An eclectic mix if I do say so myself...parentling, chick-lit, historial fiction, suspense novel, leadership, biography and even a diet book! (Oh, and I see the egg dying kit I misplaced before Easter!) It's all good. 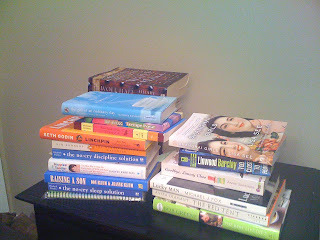 Hubbie has a similarly stacked pile on his nightstand...we definitley have broad tastes in books.